The Maple Tree Inn began serving its first pancakes and maple syrup in the year 1963. 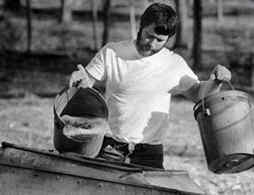 But first, let’s go back to when the Cartwrights first began producing maple syrup. Jacob Closser, Ronald’s great-great grandfather, began the operation back in the 1850’s with seven small evaporators. The maple syrup he produced was made into sugar cakes and peddled in Geneseo, Mount Morris, Nunda and Dalton. In 1913, Austin Cartwright, Ronald’s grandfather, bought the farm and sugar bush from Jacob’s heirs. He then continued the tradition of producing maple syrup. Ronald, along with his brother Clarence, and two sisters Eileen and Norma, came to live with their grandparents, Austin and Grace Cartwright in 1933, after their parents died within five months of each other. This was quite an undertaking, considering that all four of the children were under the age of seven. Ronald, Clarence, and their grandfather maintained a small shack on the farm which burned in 1937. They then built another one which Ronald and Clarence continued to operate after their grandfather died in 1961. But as fate would have it, that shack also burned in 1962. Still wanting to continue producing maple syrup, Ronald and his wife, Virginia, whom he married in 1949, decided to build another sugar shack in 1963; however, this one was going to be different. They discussed the idea of building a restaurant where they could serve pancakes just like the ones Ronald’s grandmother used to make, and sell their syrup to the public instead of selling it in bulk to Vermont. Thus, the Maple Tree Inn was born. Since the restaurant began, there has never been a shortage of helping hands as Ronald and Virginia had six children -- Dale, Brenda, Dewight, Kenny, LaVergne and Rhonda. Life was kept	hectic with running the restaurant, managing a large dairy farm, and attending school activities. The Cartwright business has seen much progress over the years. The family has grown and now the grandchildren are helping. 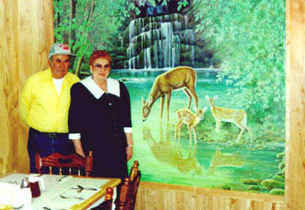 The restaurant has been remodeled and expanded many times, all the while perfecting the famous family pancake recipe. The restaurant originally seated just fifteen people. The family places over 10,000 taps each year and most of the sap is piped by tubing to holding tanks. The large evaporator is still fired by wood, but the time-consuming task of boiling has been greatly reduced by the 1984 installation of a reverse osmosis machine. This modern equipment removes the excess water from the sap, thus reducing the time and energy needed to produce syrup. In 2006, we became the first syrup producer in the United States to own and operate a state-of-the-art evaporator. This stainless steel evaporator is lead free, has a pre-heater to warm the sap prior to boiling, uses less wood, and operates more efficiently, assuring greater control in producing high quality syrup. Our new Reverse Osmosis Machine, purchased in 2015, can process 3600 gallons of raw sap per hour. In June 2004, Ronald’s health took him from the family. Virginia continues to honor and uphold the traditions of the Maple Tree Inn begun so many years ago. Despite its somewhat out-of-the-way location, we have managed to attract people from around the world each spring season. Our customers come from as far away as Germany and Japan, and as close as across the road. On occasion, the woods-like setting enables visitors to view deer and wild turkey from the restaurant. So, no matter how far you’ve come, we’re very glad you did, and it’s a pleasure for our family to serve you.